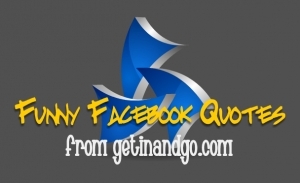 Home→Funny Facebook→Midweek Top Ten Funny Facebook Quotes – Vote Now! Time for more Midweek Funny Facebook Quotes – Top Ten Voting edition. Read through them all and then vote for your favorites. When I post Friday’s Funny Facebook Quotes, I will let you know who the winners are. Have fun, share with your friends. I love reading these funny status updates. I really want to thank my Facebook friends for writing such great stuff. Seriously, I think is cuz I’m bored, but there are so many words that contain the word “man”…wo”man”, hu”man”, boogy”man”, Cay”man, com”man”do, “man”icure…what is going on here? Comment: Post the problem on Facebook … that’s what I do. Also, I e-mail every teacher I know. Good luck!!! If a synchronized swimmer drowns, does her partner also have to drown? Comment: We can only hope. Spring must be finally coming! We had the front door open and a snake welcomed itself into our home. Unfortunately, I had to dispatch Mr. Snake back outside! Comment: Yep! They should just say drop your pants! If you need to be humbled just get braces. Every time you eat or talk you’ll feel it. Some days I just want to rip them off. It’s been 3 weeks and I’m still aware of them almost all the time. I sound weird when I talk. But it also bonds me to other people who wear braces, like we’re in a club (all ages welcome). So in that way I love them. Just downloaded the Big River Musical Soundtrack. Watch out people, you will be hearing songs like “She’s got one big breast in the middle of her chest” for a while. And yes, I am going to like my own status because I am thinking I am that cool.